Philips Lumileds a family of high flux density LEDs in wavelengths of 380-430nm. 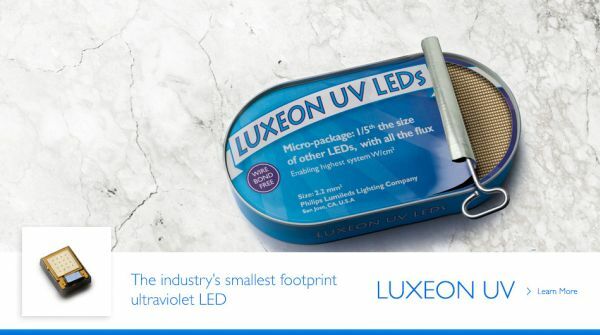 The Luxeon UV LEDs are designed for applications including ultraviolet curing, counterfeit detection, medical, industrial and specialty lighting. “The UV LED market has been hampered by limited flux density and a lack of design flexibility,” said Kurosh Hashemi, Senior Product Line Manager at Philips Lumileds. “The company addressed these limitations by introducing a compact, high-power emitter that can be tightly spaced to deliver the highest flux density to the desired medium. For example, for curing applications, 395nm emitters enable arrays of up to 38W/cm2 when driven at 1A,” said Hashemi. The device micro-footprint is 2.2mm2, and each LED is provided in undomed form for precise optical control.